Home Savings recently donated $5,000 to Lakeview Local Schools. The schools, in collaboration with the City of Cortland, will use the funds to refurbish the tennis courts at Willow Park. The courts are utilized by the tennis teams and students who attend summer camp. 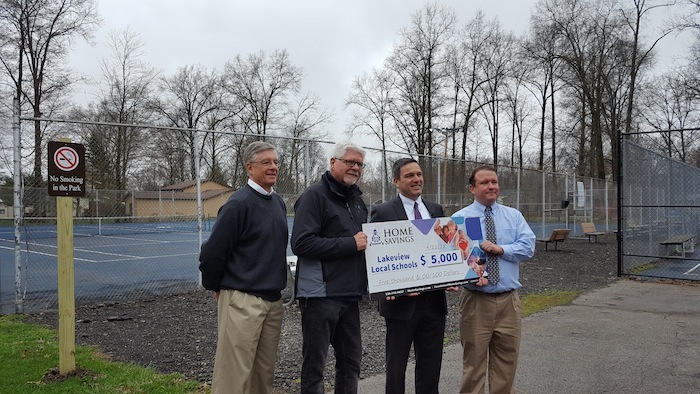 Above, from left are Dave Christner, Cortland Parks & Recreation board; Cortland Mayor Jim Woofter; Troy Adair, treasurer, Home Savings; and Sean Miller, treasurer of Lakeview Local Schools.